I photographed Bernie October 7, 1999 for a business magazine. It was one of the first portraits I ever made on assignment. Today, at 8:30am, Bernie was arrested by the FBI and was set to be released this afternoon on a $10 million bond. The charge? $20-$50 BILLION in Securities Fraud. Yes, Billion. Bernie was once even chairman of the NASDAQ. 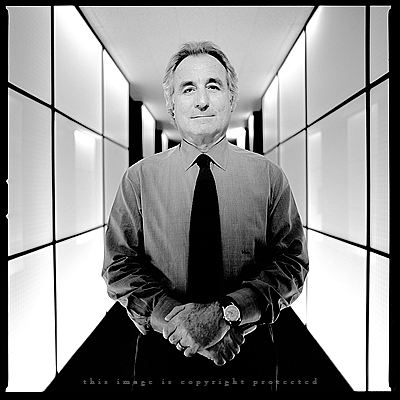 Madoff told employees he was “finished,” that he had “absolutely nothing,” that “it’s all just one big lie” and it was “basically, a giant Ponzi scheme,” according to a criminal complaint in U.S. District Court in Manhattan. The disclosure came after Mr. Madoff tried to distribute early bonuses to employees of his firm, (approximately $200 million to $300 million to “certain selected employees, family and friends.”) prompting questions by senior employees, a person familiar with the situation said. Mr. Madoff, 70 years old, allegedly told employees he had a couple of hundred million dollars left and wanted to distribute it before turning himself in to authorities, this person said. Who Would Ever Sing About A Sensor. San Francisco 903 | 1. Flying | October 27, 2008.